Energy Work: As an energetic healing practitioner, I help you rediscover areas in your body that remember your wholeness, joy, peace. Such a journey enables one to release areas of holding lovingly. The sessions are about one hour long, on a massage table fully clothed, and the work is noninvasive. I have witnessed amazing experiences with this work because it creates a space that helps the receiver feel safe enough to let go. Experiences can range from a sense of well being at the end of a session to an emotional catharsis. Clients have told me that this work helps with the side effects of chemotherapy such as nausea and other flu-like symptoms, as well as working through emotional/spiritual issues. See testimonials below. Body Work: Are You Abusing Yourself? Check in with yourself for a moment. Do you feel rushed all day? Do you sacrifice meals, or sleep, on a regular basis? Do you drink too much coffee? Feel stressed? Body always hurts? Too many people demanding too much? Experiencing emotional upheaval but don't have time to be with it? Be kind to yourself. Take the time to unwind your body and mind. Release muscle tension and toxins, improve joint mobility and restore energy reserves with a massage. The nervous system relaxes and circulation increases, which in turn enhances immune function. Sleep quality is improved and anxiety lessens. I incorporate a variety of energetic and body modalities to provide a therapeutic experience for your body, mind and spirit in a traditionally draped session. I find that energy work combined with massage is most effective for overall sense of well being. See testimonials below. Workshops: Please call 805-708-5164 for more information if you are interested in Reiki classes, energy medicine classes or workshops on self care and spirit/heart/body explorations. Ceremonies: We can create together a ceremony to honor and mark beginnings, endings, and auspicious occasions. For example, I have had requests for ceremonies to mark farewells--the passing of beloveds (human and animals), loss of a home, a marriage, a childhood memory. And I have had requests for celebratory ceremonies for new homes, new relationships, new jobs, new life paths and birthdays. Any moment is sacred if it is meaningful to you. Gift Certificates: Please call 805/708-5164 to request one. I customize the certificates for special occasions. 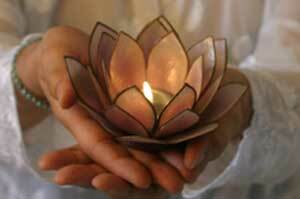 I have been trained in Reiki through the master level, Healing Touch through the practitioner level, Biosynthesis through the three-year foundational training in somatic and depth psychological education, a graduate of the Metta Institute’s year-long End of Life Care Practitioner program, sound therapy, and other forms of energy work. I have studied extensively with Gabriele Hoppe and Gabriel Stux. Reiki and Healing Touch are two types of hands on energy work recognized by the established medical profession, and used in hospitals. I am a licensed massage therapist (a graduate of the SB Body Therapy Institute), a volunteer for Visiting Nurses and Hospice Care and the Compassionate Care Program at Cottage Hospital both in Santa Barbara, and I teach workshops in healing modalities from an introductory course, “Energy Medicine 101” to “Energy Medicine: Reiki series.” I am a member of Phi Beta Kappa, the International Institute for Biosynthesis, and the International Society for the Study of Subtle Energies and Energy Medicine. "My husband, Kim, was placed on hospice care and that is when we had the great good fortune to meet Lillian Kurosaka. 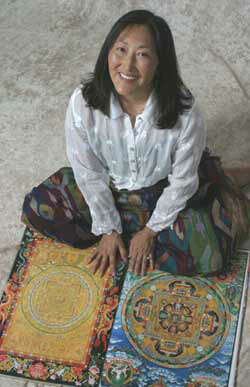 Her peaceful demeanor and spiritual outlook was a wonderful match for Kim. He used to tell me that he didn't know how Reiki worked, but that he felt so peaceful and calm after the sessions. I have to admit that Kim was not always open to alternative treatment methods; but, he trusted Lillian and himself and opened up to whatever came. When a person is faced with a life-threatening illness, as Kim was, it is wonderful to have a competent, loving person willing to share their knowledge and expertise to help alleviate one's suffering. Lillian did this." "I am a psychotherapist and part of my work is to deal with issues of family crises, including the consequences of litigous divorce situations. I have always benefited from massage, and found Lillian several years ago. My seeking Lillian's talents far exceeded what I sought to accomplish. In addition to the physical relief gained from the massage, I found that Lillian's attunement to the energy quotient in my body, mind and spirit, provided an invaluable balance. Every time I have a session with her, I leave feeling powerful, serene and grounded. I have the opportunity to work with many talented professionals in all disciplines, and consider Lillian to be at the top of the list of valuable resources. She is a treasure, gifted in her art and a catalyst to healthy living." "From the time she came to visit me in the hospital in 2001 after radical surgery for cancer through subsequent years of healing and transformation, Lillian has been a powerful force of regeneration and restoration in my life. 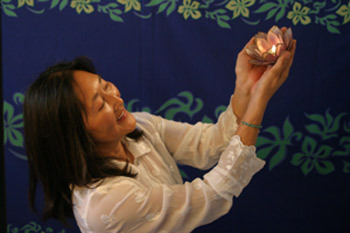 She knows a wide range of healing arts, from energy work and guided meditation to hands-on massage. Over the years, I have needed different types of help from her, and Lillian always instinctively knows what my body, mind and spirit require. As an amputee, the profound asymmetry of my body often requires physical intervention in order to restore balance and sooth overworked muscles. I am deeply grateful to Lillian for her gifted hands, fingers, elbows, forearms and voice, all of which bring me to center and wholeness." "It was important for me during chemotherapy to conduct my own healing process while my body was compromised and under assault. My sessions with Lillian were invaluable. The palpable exchange of healing energy boosted my health immeasurably. I could feel currents of energy flow into me from her. She could "see" injurious bacteria and pull them from my body. She's an extraordinary, powerful intuitive healer." "I've known Lillian Kurosaka for over fifteen years. I've received energy work from her for about the last nine years. Lillian has an innate talent, hers is a gift that cannot be learned. She is able to work as a pure channel, with no ego involved, to allow healing energy to pass through her and directly into the client, where it is needed the most. She is the best kind of therapist, someone who offers her services not because she wants the attention, but simply because it is her gift and she is willing to share it. The healing that comes from that place, of course, is powerful. I have turned to Lillian for help with both emotional and physical problems, and been astounded at the results. When the chips are down, as they sometimes are, I call Lillian." "Lillian guided me gently and deep, rustling and moving the internal process, as if a kind wind came through me on a molecular level and blew the old, dead energy clean away." "As a dedicated and talented guide, Lillian has the ability to help open you to yourself with both love and wonder; what better gift can there be? I recommend her without reservation." We are our own best healers. I invite you to add energy and/or body work to your "care package."